Warsaw (AFP) - Poland's new right-wing, eurosceptic government was sworn in Monday signalling it would take a hard line on Europe's biggest migrant crisis since World War II -- even floating the idea of sending Syrians back to "liberate" their country. The new cabinet observed a minute's silence for the victims of Friday's terror attacks in Paris at the swearing-in ceremony at Warsaw's presidential palace. 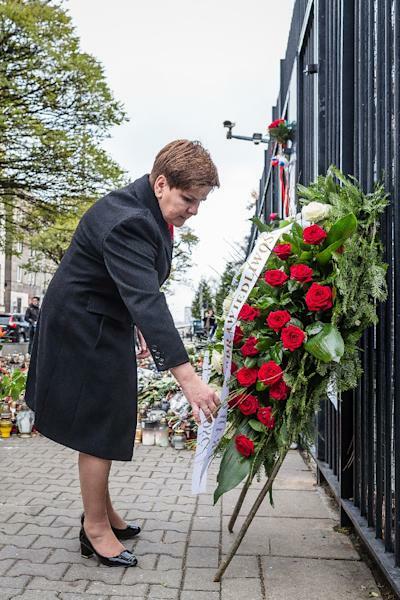 Earlier Prime Minister Beata Szydlo led her cabinet in laying flowers and lighting candles in front of the French embassy in memory of the 129 people killed in the attacks, the worst in France's history. Szydlo is in the comfortable position of leading a majority government and therefore controlling parliament, thanks to her Law and Justice (PiS) party's landmark victory in the October 25 election. 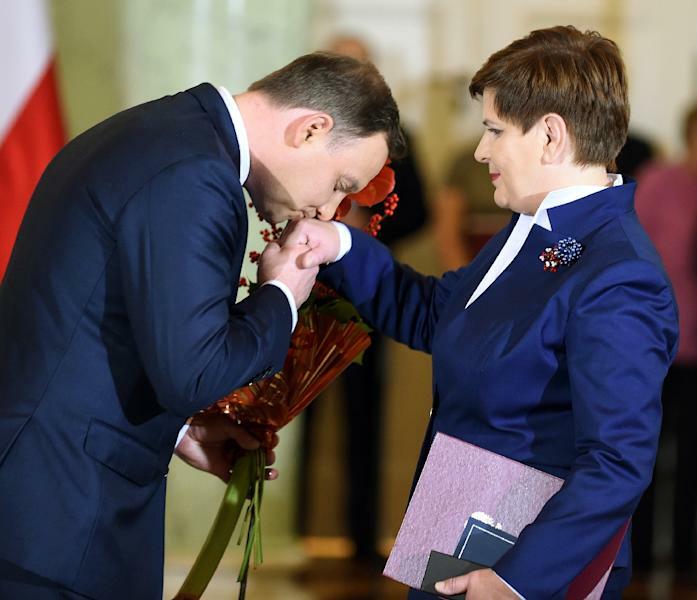 She can also expect a helping hand from PiS-backed President Andrzej Duda. During the election campaign the party vowed to close Poland's doors to refugees and migrants and instead lend financial support to EU efforts at tackling the crisis. It also promised to hike welfare spending and taxes on banks and foreign-owned supermarkets. New Foreign Minister Witold Waszczykowski suggested Sunday that Syrian refugees pouring into Europe could be trained to form an army and return to "liberate" their homeland. "Hundreds of thousands of Syrians have come to Europe recently. We can help them form an army," he said. "Tens of thousands of young men disembark from their rubber dinghies with iPad in hand and instead of asking for drink or food, they ask where they can charge their cellphones. "They can go to fight to liberate their country with our help." Waszczykowski said he was trying to avoid a situation where "we send our soldiers to fight in Syria while hundreds of thousands of Syrians drink their coffee in (Berlin's) Unter den Linden" boulevard or in other European cities. In her first interview since taking office, Szydlo told broadcaster Polsat on Monday that Poland would nonetheless honour the commitments made by the previous liberal government, which agreed to host more than 9,000 refugees in the framework of the EU's relocation plan. "We honour all commitments," Szydlo said, while adding however that "the security of Poland and its citizens is paramount." Her reassurance came after Konrad Szymanski, deputy minister for EU affairs, said Poland would not take in refugees under the hotly contested EU redistribution programme in the wake of the Paris attacks. A known eurosceptic, Szymanski later appeared to backtrack on his words, insisting Poland would only take in refugees "on the condition it gets security guarantees." Szydlo on Monday called for "serious discussion at the European level" on finding a solution to the migrant crisis. "Obviously we need to set up an aid system for those who are at risk, whose life is at risk, but we can't thoughtlessly make decisions that not only don't solve the problem but also make the problem worse," she told Polsat. The 52-year-old coal miner's daughter has vowed to "fix" Poland. Priorities include a family allowance of 500 zloty (117 euros, $126) per child to boost low birth rates, lowering the pension age, increasing tax exemptions for lower income earners, tax cuts for small and medium businesses and tax hikes for banks and foreign-owned supermarkets. The conservatives also say they will create 1.2 million jobs at home to stem the flow of Poles to western EU states like Britain and Germany in search of jobs and a better life. Despite a global push to cut greenhouse gas emissions, the PiS government has vowed to keep coal as Poland's main source of electricity. To do so, it wants to renegotiate its commitments on emissions cuts.